Nielsen looked sharp and Barbosa didn´t. The Brazilian was down in the second from a southpaw left to the chin in the second and did well to survive that but he was not in shape and caved in from a southpaw left to the body late in the fourth. Gogichashvili was floored twice and it was ruled as KO even if it looked as a tko to me. Markussen looked rusty but eager and kept landing a big, right hook / overhand right. Nielsen had a rough first round as Valori forced him to fight on the inside and caght him with heavy hooks. However Nielsen tightend up his defence in the second and began to wear down his tough opponent with his own tactics fighting and wrestling on the inside. 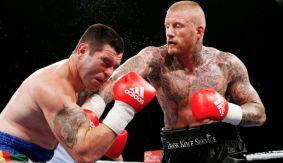 Nielsen had Valori against the ropes in the fourth and closed the fight with his heavy southpaw left that landed twice before Valori went down and was counted out in the act of rising. It was scored 30-27 twice and 29-28 all for Nielsen after Three. 80-70, 80-71 twice - no knockdowns but one-way traffic with Guillen too small to have an impact. Ceylan is a good boxer but lacks punch. 60-54 on all cards. Khattab was out to impress and while was flashy he failed to hurt Kiss, a strong but limited trialhorse. 79-73 on all cards but it looked closer than that. Castegnaro had Lihaug in some troubles in fifth but tired and Lihaug´s conditioning told as he closed the fight strongly. Kun had Havnaa in some trouble early in the round but Havnaa had superior strength and firepower and floored the Hungarian twice for a stoppage at 1.42. Fröjdholm, southpaw dominated the fight early on, then lost his way against a wild swinging but rather poor opponent but his better conditioning saw him through. Benadze looked as if he was about to collapse the way he staggered back to his corner but he plugged away until caught by a left and fell on his back and it was stopped after the mandatory eight count and ruled a KO. Masson won the vacant EBU title on scores of 117-111, 116-113 and 117-113. 40-37 Khasiev, 40-37 Gasanov and 38-38.
vacant WBC Silver bantam title. Rovjagins floored and stopped. Forsman sparred afterwards with Jevgenijs Andrejevs and Florians Strupits. Krasnolutsky was floored twice before it was stopped.